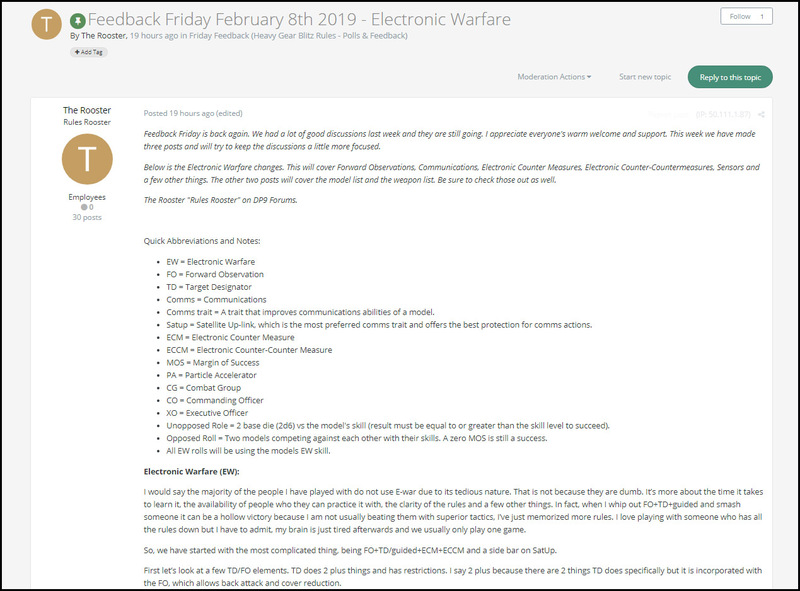 Dream Pod 9: HGB Feedback Friday (February 8th 2019) - Electronic Warfare, Model List, & Weapons List Rules Discussion! The first post is on Electronic Warfare (EW) and the changes we are proposing. Covering Forward Observations (FO), Communications (COMMS), Electronic Counter Measures (ECM), Electronic Counter-Counter Measures (ECCM), Sensors and a few other things. See how we think EW can be improved and be made easier to understand. You can checkout the complete post on the DP9 Forum at the link below, login and join the discussion. Our second post is on the updated Model List and includes the complete HGB Model List we plan to included in the Living Rulebook. All saved as an excel file that you can download and checkout on your computer. 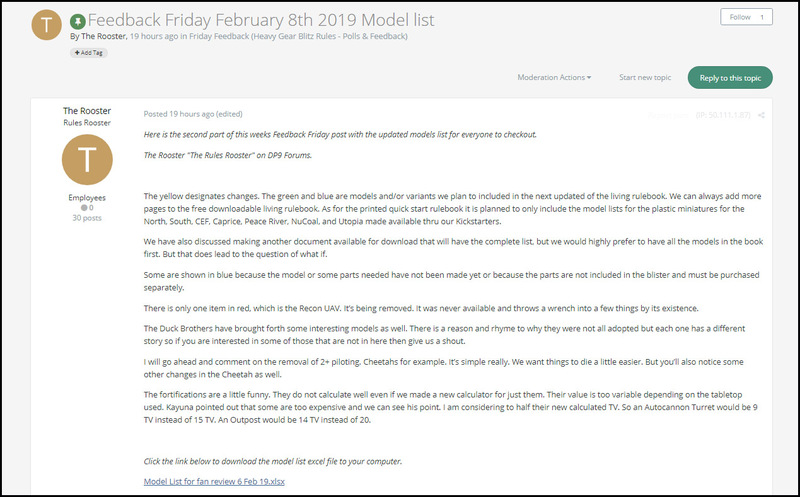 Here is a link to the Model List post on the DP9 Forum, login and leave your feedback on the proposed changes and other models you would like to see. Our third post is the updated Weapons List and includes an excel file of the list that you can download and checkout. 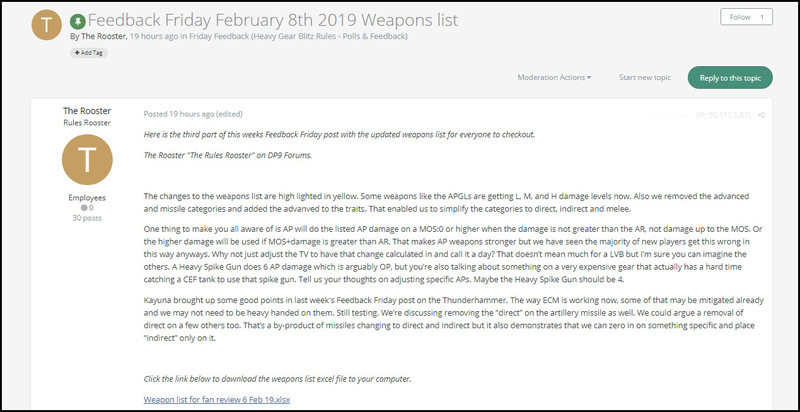 Here is a link to the Feedback Friday - Weapons List post on the DP9 Forum, login and leave your feedback on the proposed changes. Home › Blogs › Robert Dubois's blog › HGB Feedback Friday (February 8th 2019) - Electronic Warfare, Model List, & Weapons List Rules Discussion!